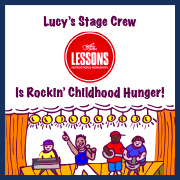 So what does $10 or 10 mean in Lucy's $10 or 10 First Annual Kids Charity Concert? Lucy's goal is to raise money and collect needed items for the below charities. To do that, she's created the $10 or 10 ticket price. 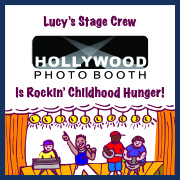 Alinea, Alone Together, Coyotes of Topanga, Max Tomack, Moxie, Permanent Record, The Brothers Gage, and The Campbells will be rockin' childhood hunger at Lucy's Kid's Charity Concert! Auctioning Off Silent Auction Items from Concert!!! 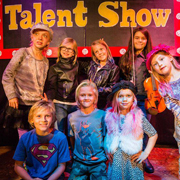 Thank you to everyone who made my very first kid's charity concert a rockin' success. We raised just over $1,400 for the charities. That doubles how much I've donated over the last three years! 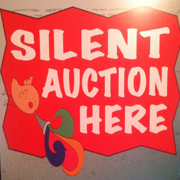 BUT...everyone was so mesmerized by the music that they forgot to bid on several amazing silent auction items. 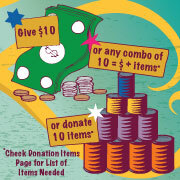 With your help, we can DOUBLE or TRIPLE the amount of money we raised for the charities. Challenge Accepted – Community Hunger Challenge #2 RAISES $125 - That's 500 Meals! Community Hunger Challenge #2 Results:I gave back and helped in the fight to end childhood hunger with Share a Square Meal. 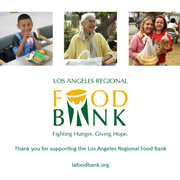 I raised $125 for the Los Angeles Food Bank. Since $1 is equivalent to 4 meals, $125 equals 500 meals. That is equivalent to having three square meals a day for over 166 days. 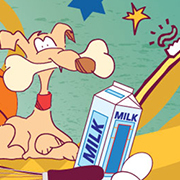 Let’s take a timeout...and help us tackle childhood hunger. 42 million people are facing hunger. That is 1 out of every 8 people. Out of those 42 million people, 13 million are kids. We all need to help to lower this number. Since the super bowl is coming up, here is a few ways you can help while getting ready for the big game. 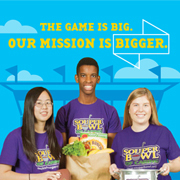 Community Hunger Challenge #1: We challenge you to join the Souper Bowl of Caring movement. 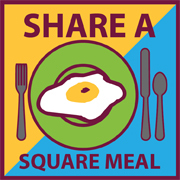 Community Hunger Challenge #2: We challenge you to give back with Share A Square Meal. 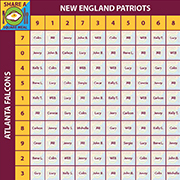 It is just like your regular football squares with a good twist to it. All you have to do is have your friends buy different squares for the super bowl. Then you have the winners get half the money and the other half goes to the charity of your choice like the Los Angeles Food Bank. Community Hunger Challenge #3:I am Lucy and I challenge you to try to eat on $4 a day. For the next 5 days I am going to try to eat healthy for as little as possible. 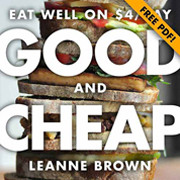 To do so, I will be making recipes from Leanne Brown’s cookbook called Good and Cheap. I challenge you to join me and try to eat healthy on $4 a day. And when I say "a day" I mean breakfast, lunch, snack, and dinner. I know it sounds impossible, but families in poverty have no choice but to live like that. LF: “Pay it Forward” is a global initiative that exists to make a difference by creating a huge ripple of kindness felt across the world – your non-profit Food Forward is a local initiative spreading kindness through eight counties in California… What is Food Forward? 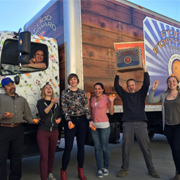 LJ: Food Forward is an Southern California based non-profit that rescues fresh produce from backyard fruit trees, orchards, farmers markets, and the Los Angeles Wholesale Produce Market. 100% of what we collect is donated to hunger relief agencies across 8 counties in our region. Since 2009, Food Forward has recovered and donated over 30 million pounds of fresh produce and will help to feed 1.5 million people in need in 2017. 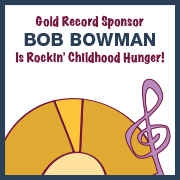 Here's to Your First Gold Record Bob Bowman! We couldn't do it without your record-breaking contribution! Gold Record Sponsor Jason Babcock! 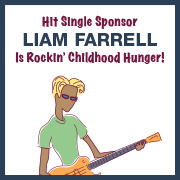 Thanks for cutting a record for childhood hunger! 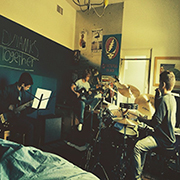 Welcoming Back Guitar Center Studios for a Repeat Performance! I'd like to thank Guitar Center Studios for once again singing on to provide the back line and sound engineer for our performers. Liam Farrell Is A Hit! We couldn't do it without your chart-topping contribution! 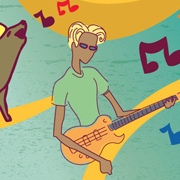 Q: What is the name of your band? Slade: No, we don't like Coke and the name describes us.